Pubs, Bars, clubs and lounges in India have grown faster than cafes in past few years majorly driven by younger consumers, competitive pricing and a proliferation of options. The expansion of commercial real estate sector is also driving the growth of PBCL market significantly as the malls are becoming first choices for getaways and day out centers in small cities are supporting the development of organized PBCL market, which are providing services at reasonable prices. Moreover, rising popularity of alcoholic beverages, especially among youth, can be attributed to dramatic lifestyle changes, which is majorly driven by rising income levels. Goldstein Research analyst forecast the India PBCL market to grow at a CAGR of 10.3% during the forecast period 2016-2024. Further, the market is anticipated to reach USD 3.6 Billion by the end of forecast period owing to high disposable income, exposure to media, greater availability and penetration of a variety of consumer goods. The report covers the present ground scenario and the future growth prospects of the India pub, bar, club, lounge (PBCL) market for 2016-2024 along with the total revenue of PBCL market in every region. We calculated the market size and revenue share on the basis of revenue generated per segment and region on a country level. The revenue forecast is given on the basis of the number of real estate developers and current growth rate of the market. Based on ownership type, standalone PBCL market accounted for the largest revenue of more than 85% in 2016, while the chain market contributes approximately 15% of the total market, is expected to register an above average CAGR to increase its contribution to more than 20% by 2024. 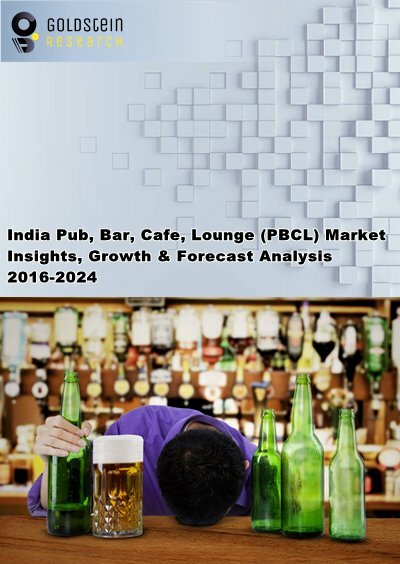 India Pub, Bar, Club, Lounge (PBCL) Market Outlook 2016-2024, has been prepared based on an in-depth market analysis from industry experts. The report covers the competitive landscape and current position of major players in the India PBCL market. The report also includes Porter's five force model, SWOT analysis, company profiling, business strategies of market players and their business models. India PBCL market report also recognizes value chain analysis to understand the cost differentiation to provide the competitive advantage to the existing and new entry players. Our India pub, bar, cafe, lounge (PBCL) market report comprises of the following companies as the key players in the India PBCL market: Impresario Entertainment and Hospitality Pvt. Ltd., Olive Bar and Kitchen Pvt. Ltd., Massive Restaurants Pvt. Ltd., JSM Corporation Pvt. Ltd., Hard Rock Café, Manchester United, Shiro and Blue Frog. According to our India pub, bar, cafe, lounge (PBCL) market study on the basis of extensive primary and secondary research, one major trend in the market is attractive offerings by PBCL outlets to draw more consumers. PBCL outlets are offering varied entertainment offerings such as board games, comedy nights and even live performances. For instance, Howzatt and IIFA Buzz Café have adopted sports and Bollywood themes to differentiate themselves in the competitive market. According to the report, a major driver in India pub, bar, cafe, lounge (PBCL) market is growing investment by international brands in Indian PBCL market. In past few years, PBCL market has witnessed a continued shift from the unorganized to an organized industry. As a result, the organized industry is significantly increased which is backed up by the new investments by foreign brands. Further, the report states that one challenge in India pub, bar, cafe, lounge (PBCL) market is liquor licensing and sourcing. In terms of starting new business and expansion liquor licensing and sourcing emerged as the major growth barrier, as the necessity to obtain a number of mandatory licenses and regulation related to hours of operation and consumers minimum age, which varied from state to state. Geographically, metro cities such as Delhi-NCR, Mumbai, Hyderabad, Chennai, Bangalore, and Kolkata accounted for the largest market share in 2016. However, major brands are also focusing on Tier-II and Tier-III cities such as Lucknow, Chandigarh, Jaipur, and Pune among others to expand their business, on account of developing infrastructure and business opportunities.